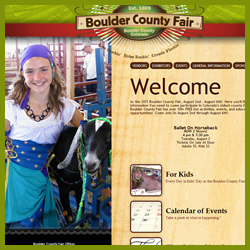 The Boulder County Fair in Boulder County of Colorado is a long-standing tradition that has a huge number of events celebrating the local area and agriculture. Free gate admission and parking make this a very affordable family event. Ticketed grand-stand events are just a small portion of the fun to be had. Entertainment, Childrens interactives and contests and activities for the whole family, come on out!